Prime Minister Justin Trudeau rallied Liberal MPs assembled in Saskatchewan for a caucus retreat with a campaign-style speech of sorts Wednesday, telegraphing what messages his party will run on in the next federal election. Prime Minister Justin Trudeau rallied Liberal MPs assembled in Saskatchewan for a caucus retreat Wednesday with a stump speech of sorts, telegraphing the messages his party will run on in the next federal election campaign. Trudeau listed off what he described as his government's accomplishments to date — contending that, for example, 500,000 more Canadians are employed now than when the Liberal government took office in 2015. He fired a shot across the Conservative Party's bow, saying they have "absolutely no plan" for the economy. Trudeau also claimed middle-class Canadians are, on average, $2,000 richer than they were under the former Conservative government. He did not cite sources for these figures. "After 10 years under Stephen Harper, of slow growth, rising income inequality and inaction on the environment, they're offering the same flawed approach. Well, that's completely unacceptable," Trudeau said. Conservatives have long maintained that, despite the Liberal Party's rhetoric, the government's plan to impose a national carbon tax on all provinces will make life costlier for Canadians. The government's record on the pipeline file also has been a target of Tory criticism. Trudeau made no mention of NDP Leader Jagmeet Singh, a sign that the Liberals are squarely focused on the person they see as their main opponent: Conservative Leader Andrew Scheer. Trudeau also acknowledged that many Canadians are anxiously following the back-and-forth with the Trump administration over the NAFTA negotiations in D.C., praising the work of the "tireless" Foreign Affairs Minister Chrystia Freeland on this file. Freeland has spent much of August and early September locked in talks with her U.S. counterpart, Bob Lighthizer. "Chrystia, every day you are standing up for Canadian workers, defending our interests and working tirelessly to get us to a deal that is good for Canadians and good for Canada," he said. 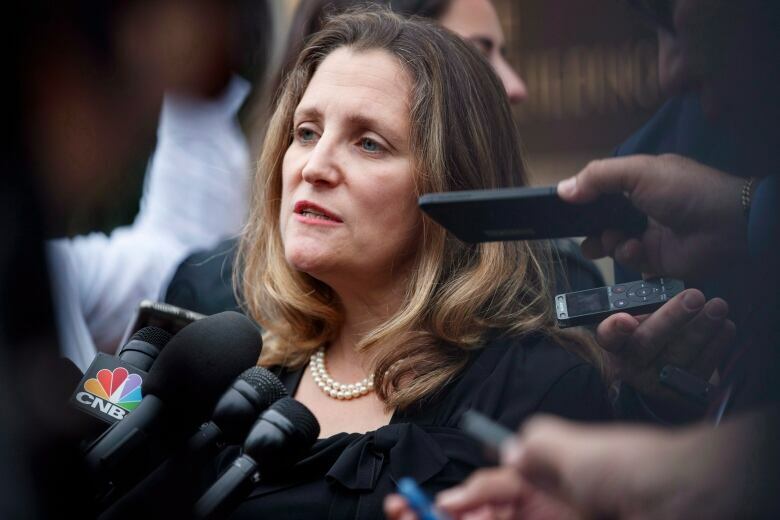 Freeland updated reporters on the NAFTA negotiations late Wednesday, saying she briefed the prime minister twice on the sidelines of the caucus retreat. "This is an important time in the negotiation to speak with the prime minister directly and get his instructions on where to go moving forward," Freeland said. She said Canada's chief trade bureaucrat, Steve Verheul, will return to Washington on Thursday for more talks with his U.S. counterparts to sort out some "technical" details that are still under review. Canada's ambassador to the U.S., David MacNaughton, was also on hand Wednesday to speak with the PM. A number of U.S.-imposed deadlines have come and gone in recent weeks, but negotiators are eager to put pen to paper by the end of the month so some text of the deal can be sent to Congress for its 90-day review period. Trudeau said Liberal MPs will spend much of the next two days discussing the status of the trilateral trade deal. The national caucus meeting, which will end Thursday, is also expected to address the government's plan to study a "full ban" on handguns. Trudeau said that, in addition to proposing "absolutely no plan to grow our economy," the Tories are threatening the future of the country's kids because they're opposing the Liberal plan to levy taxes on carbon pollution. Some of the country's conservative leaders, notably Saskatchewan Premier Scott Moe, have said they can fight the effects of climate change without having to impose more taxes on Canadians. 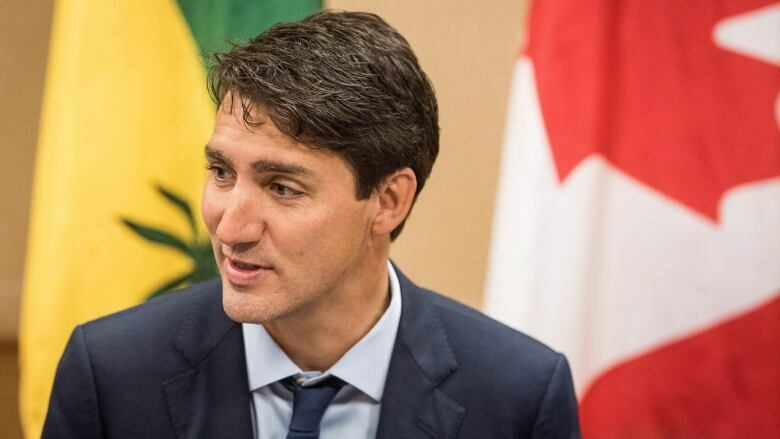 After meeting with Trudeau Wednesday in Saskatoon, Moe told reporters he believes his province's climate plan — which is largely based on its carbon capture and storage program — should be considered sufficient to meet a federal call for a provincial climate strategy. The feds insist, however, that the national climate plan demands some sort of carbon pricing mechanism, Moe said. "There's a fork in the road that we're fast approaching," Moe said, calling the relationship with the federal government "frosty ... I was disappointed. "The ball is in the prime minister and the federal government's court with respect to the ongoing relationship with myself and the government of Saskatchewan." Environment Minister Catherine McKenna said Ottawa is reviewing provincial climate change plans — they were all submitted for federal review by the Sept. 1 deadline — but she said Ottawa will not hesitate to "step in" and "return the revenues to individuals directly" if Saskatchewan continues to balk. In addition to his broadside against the federal Conservatives, Trudeau also made a thinly veiled reference to Ontario Premier Doug Ford and his controversial decision to invoke the notwithstanding clause against a court order overturning his plan to downsize Toronto's city council. "I think that bears repeating. We will always defend and uphold the Charter of Rights and Freedoms and the fundamental rights and freedoms of every Canadian," he said. On Monday, an Ontario court found the new provincial government's move to slash council was unconstitutional, coming so close to the next municipal election on Oct. 22. The federal Liberals have called Ford's move "disappointing" but have so far rejected calls to intervene. Ford's decision to use the Constitution's notwithstanding clause allows the provincial legislature to set aside a court ruling for a five year period.